Legislation and building regulations require reasonable provision in both new and existing buildings to make them accessible to everyone. Design and specification of doors and doorsets for accessibility must take into account factors such as clear widths, maximum opening forces, correctly positioned glazing to provide through visibility, suitable ironmongery for ease of use, and visual contrast. The standard Shadbolt construction and purpose-made manufacturing mean that we can supply accessible doors as standard, whilst meeting performance requirements for fire and smoke protection, acoustics etc. Wider doors can be made without loss of performance. 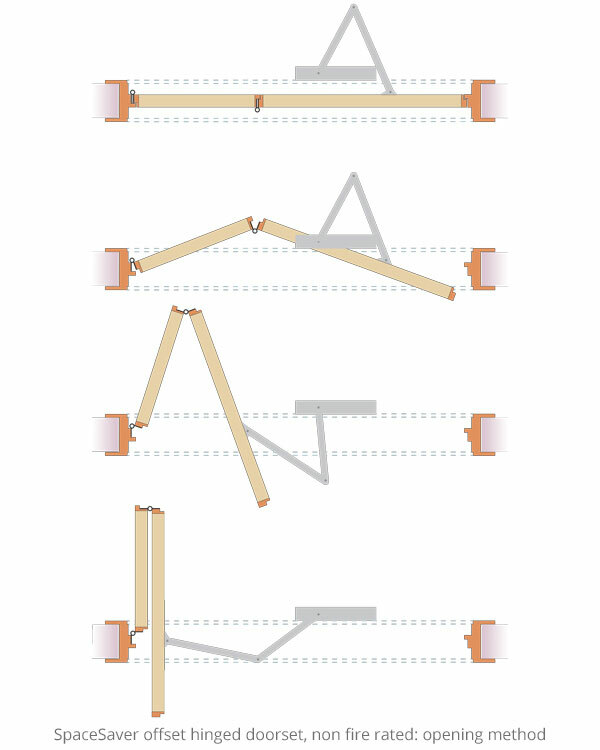 Various alternative opening arrangements where space is limited, such as sliding or folding doors. The same stability and mechanical performance as standard doors. If required, the same fire and acoustic performance as standard doors. Vision panels can be fitted without loss of performance. SpaceSaver doors have an offset folding action with a much smaller opening arc than a conventional door. 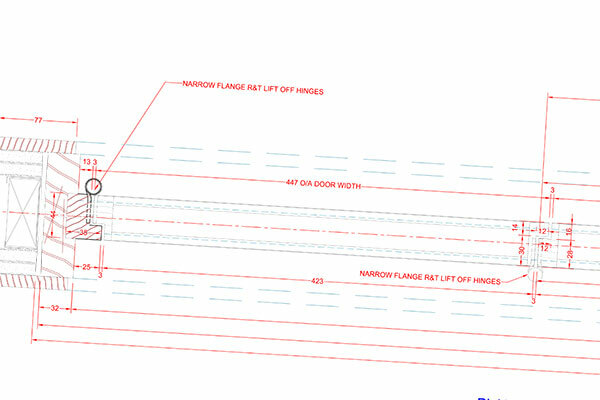 This provides greater flexibility in layout design of disabled access, especially where space is limited. Wider doorways can be provided even in restricted spaces, giving easier access for both wheelchair users and ambulant disabled persons. Extra space around the door minimises obstruction when open, eg in corridors and lobbies, and where there are sets of doors close together. Standard robust and stable leaf construction. Supplied as a complete, fully finished doorset with frame, door gear and ironmongery. Doorsets are purpose-made and details can be varied to suit requirements. For WCs and bathrooms, non-vision features include a rebate at the hinge, and a frame slot for the door leading edge. For circulation routes, vision panels can be included. SpaceSaver door leaves have the standard Shadbolt construction, with the necessary hinge and track hardware fitted. In addition ironmongery such as handles, latches, locks, indicators, and door closers can be fitted as required. Vision panels can generally be included without loss of performance. Door leaves are purpose-made to sizes required. Consult Shadbolt for confirmation of available sizes before specifying. Doors can be fully finished in controlled conditions in our works to ensure high quality. A matched and co-ordinated appearance can generally be achieved for all doors in a building. ■ Wood veneers with various factory-applied finishes including semi-matt lacquer, Specula high-gloss clear polyester finish, Paintmaster enamel satin lacquer finish in any BS or RAL colour. ■ Patina high-gloss sprayed polyester lacquer finish or Signal semi-matt sprayed polyurethane lacquer finish, both available in any BS, RAL or Dulux Colour Dimensions colour. ■ Laminates: any colours or patterns of plastic laminate from major UK suppliers. ■ High impact PVC laminate facings. For more information see Veneer Finishes or Laminate and Paint Finishes. To assist in the specification of Shadbolt accessible doors, a selection of typical details are available to download below (registered clients only). Fire doors are normally required to include a self-closing mechanism to ensure they will perform their function in case of a fire. The closing mechanism must be strong enough to close the door against any smoke seals (and acoustic seals if fitted) and, where appropriate, latch it. But opening a door against the force of a such a closer can be difficult for many people including disabled and infirm, those in wheelchairs or with walking aids, with young children, with luggage, hospital trolleys etc. The requirement for reliable closing and ease of opening can be difficult to achieve in practice. 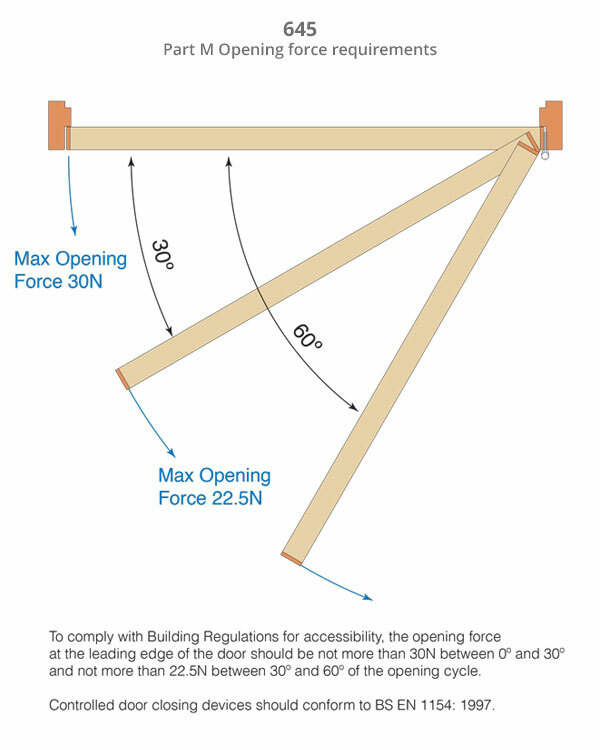 In such cases the initial force required to open the door is likely to exceed the maximum of 30N set by Building Regulations Approved Document M for accessibility. Therefore, where doors are required to comply with Part M a powered opening/closing system will probably be necessary. See illustration below, and for more information see Shadbolt drawing SPEC-645. A powered door opening and closing system controlled by various manual or automatic activation methods. Where the door can normally be left open, electro-magnetic hold-open devices with door release automatically activated by the fire alarm system. We have created an Accessible Doors brochure to provide an overview of the options available to you with regards to Accessible Doors from Shadbolt. Access standards are controlled by the following. The Equality Act 2010 replaces the Disability Discrimination Act and other legislation. It requires reasonable provision in the design of buildings to make them accessible to everyone, particularly where there is public access or people are employed. 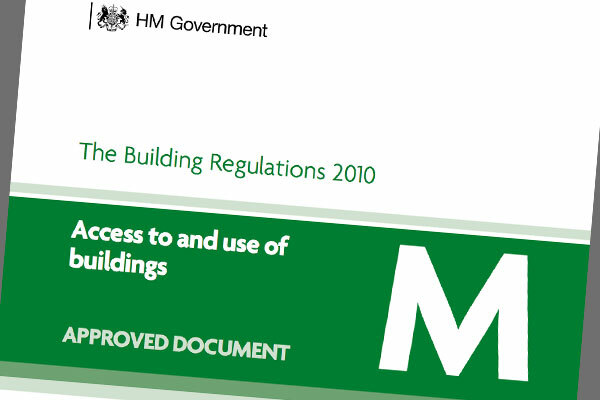 Building Regulations Approved Document M 2013 Access to and use of buildings. This applies to new buildings and alterations in England and Wales, which must comply with Approved Document M to satisfy the Equality Act. It includes requirements for door widths, opening and closing forces, size and position of glazed panels, visual contrast and threshold height. BS 8300: 2009 (amended 2010) Design of buildings and their approaches to meet the needs of disabled people. Code of practice. This gives good practice design guidance and covers additional points not in Approved Document M.
BS 1154: 1997 Building hardware. Controlled door closing devices. Deals with performance of door closers. Correct installation of a door is fundamental to its performance, and it is strongly recommended that doors are installed by an accredited installer. Shadbolt can supply instructions for fitting security doors.